These are the delicious quesadillas I made inspired by the Grilled Chicken & Pineapple Quesadillas at the pioneer woman. I made a few changes to her recipe, I didn’t grill the pineapple because I didn’t want it be too sweet. I also added onions and green peppers to the quesadillas. They were really good, and a perfect recipe for a busy weeknight. I made the chicken first by chopping it and seasoning the chicken with salt, pepper, dried oregano, dried cilantro, and cumin. I then browned the chicken in a large skillet. Then I added 1/4 cup honey barbecue sauce and 1/2 cup water. I cooked the chicken down again until the sauce had thickened back up. The process of adding the water and then reducing it will tenderize the chicken more and help you scrap up all the yummy bits off the bottom of the pan. I served these quesadillas with black bean corn salsa. I first saw this recipe in a Goya ad several years ago. It has been one of my favorite quick salad recipes every since. Its simply frozen, defrosted corn, a can of black beans drained and rinsed, a ripe tomato, a bit of onion and some fresh cilantro. I also had some sour cream, guacamole and picante sauce for dipping. 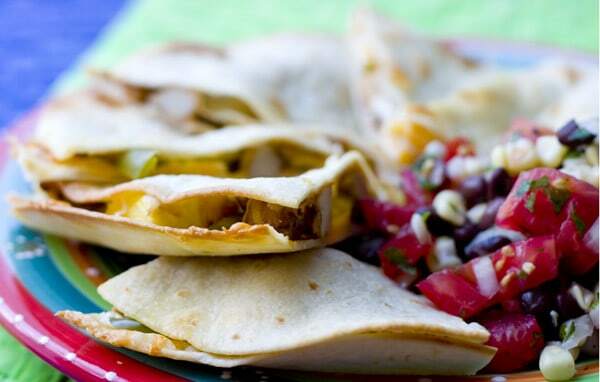 My family loves quesadillas, and we will definitely be making this recipe again. 1. Preheat oven to highest setting, mine is 550 degrees. Preheat a large skillet. Salt and pepper chopped chicken. Add spices to chicken. Drizzle pan with olive oil. Add chicken to hot pan and brown. 2. When chicken is cooked through, add barbecue sauce and 1/2 cup water. Cook until sauce has reduced and has thickened. 3. Take a tortilla and rub one side with olive oil. Put the oiled side of the tortilla down on a cookie sheet. Assemble the tortilla by adding the chicken, green peppers, onions, pineapple, and optional jalapeno peppers. 4. Take another tortilla and rub one side of it with olive oil. Place the top tortilla on the quesadilla, oiled side up. 5. Continue to make the other 4 quesadillas. Bake for 5-10 minutes at 500 to 550 degrees until lightly browned and crispy. 1. Combine all ingredients in a large bowl. Mix well. Refrigerate until ready to serve. I love everything about it! Sweeet taste of pineapple + the added black bean salsa. Yum! What a fabulous idea! I love the thought of fresh pineapple and melted cheese. This looks like a delightful summer meal. Thank you for sharing! .-= Monet´s last blog ..Chocolate Cut-Outs =-. Hey Angie! these sound absolutely delicious. I love sweet and savory foods together. In fact, I think this might be my favorite way to eat. I know this sounds strange, but I might actually try this with tofu, cheese, pineapple and peppers. I bet it would be good??? By the way, I read your comment on one of my posts. I think we had very similar childhoods. Well, at least in the realm of work. .-= Stella ´s last blog ..Guest Post with Lazaro! =-. Perfect recipe for fast supper in the upcoming hot months. It will bring nice change to our regular quesadillas. .-= Bibi´s last blog ..Corn and Cheese Fritters =-. .-= grace´s last blog ..hot tamales and free money* =-. Angie… I gotta be honest. I think my Mom fed us entirely too much “Hawaiian Chicken” when we were kids. I love pineapple and I love chicken but I can not eat them together! I love everything else about this quesadilla though… I’ll have my pineapple for dessert. Deal? .-= averagebetty´s last blog ..Dinner and a Movie with Sailor Jerry =-. .-= Tickled Red´s last blog ..Busted! Piano Recital Shenanigans. =-. What a fun recipe for quesadillas! I love the addition of pineapple, nice twist.